Kentucky  is a mideastern state of the United States. Its state capital is Frankfort. Attractions include horse racing and beautiful lakes. Kentucky is also culturally part of the American South. It is home to famous food, (Kentucky Fried Chicken) and music, (bluegrass) traditions. Western Waterlands — The region west of the Tennessee River is universally called the Jackson Purchase, or often simply "The Purchase". The rest of the region is considered part of the Pennyrile. Western Coal Fields — The only region that corresponds in both area and naming to a locally recognized Kentucky region. Caves and Lakes — Also considered part of the Pennyrile. In addition, the area has been seen as part of South Central Kentucky in recent decades. Southern Lakes — Most of the region is considered part of the Pennyrile; the eastern fringes may also be considered part of Eastern Kentucky. As with the Caves and Lakes region, this area is increasingly being viewed as part of South Central Kentucky. Bluegrass Country — This is actually the inner core of the Bluegrass region, which covers a considerably larger area of the state. Especially in the Lexington area, the term Central Kentucky is widely used. Northern Ohio River Region — The counties that are part of the Cincinnati metropolitan area are more commonly known as Northern Kentucky. The rest of the region is part of the locally defined Bluegrass, or sometimes called the Outer Bluegrass. Kentucky Derby Region — Metropolitan Louisville is often considered a region of its own, frequently just "Louisville" and also "Metro Louisville". Western portions of the Kentucky Derby Region are considered part of the Pennyrile. Eastern parts are considered part of the (Outer) Bluegrass. In addition, the locally recognized Bluegrass is surrounded by a chain of low conical hills known as The Knobs, which also run through the state-recognized Kentucky Derby Region. I-71 and I-75 both enter the state from the north at Cincinnati. The two roads split in the Kentucky suburbs, with I-71 going to its southern end in Louisville and I-75 to Lexington, continuing past Richmond, Berea, and London. I-64 runs from Ashland in the east to Louisville in the west, passing by Lexington and Frankfort on the way. I-65 enters the state from Indiana and runs from Louisville to Bowling Green, continuing to the Tennessee state line. I-24 from Paducah to Hopkinsville and the Fort Campbell area. In addition, two more interstates are slated to go through Kentucky in the future. I-66, not connected to the existing highway of that number in Virginia, is proposed to be routed through the southern half of the state. The currently existing I-69 will be extended through Kentucky. US 27 runs from Covington south to Somerset. US 127, also from Covington, runs through Frankfort, Danville and the Lake Cumberland area. US 150 offers a connection between Louisville and I-75 between Lexington and Tennessee. US 23 (Country Music Highway) connects Ashland with Virginia south of Pikeville. US 60 bisects the state from the Mississippi River to Ashland, passing through Paducah, Henderson, Owensboro and Louisville before following I-64 the rest of its route. US 62 enters the state at Wickliffe, then it links Paducah, Eddyville, Central City, Beaver Dam, Leitchfield, Elizabethtown, Bardstown, Versailles, Midway, Georgetown, Cynthiana, and Maysville. It closely follows the Western Kentucky and Bluegrass Parkways. US 68 begins just east of Paducah, running as largely an east-west route through Hopkinsville, Bowling Green and Glasgow. A short distance past Glasgow, the road takes a sharp turn to the northeast toward Harrodsburg, Lexington and Maysville. There are three large airports in the state. Louisville International Airport is served by several major airlines, including Southwest, Frontier, Delta/Delta Connection, United Express, and American Airlines/American Eagle. Cincinnati-Northern Kentucky International Airport, located off of I-275 near Hebron, is a major hub for Delta, and is also served by Air Canada, American Eagle, United Express, Comair, Frontier, and Delta Connection. Lexington's Blue Grass Field offers direct flights from fourteen cities in the midwestern, southern and eastern parts of the country via American Eagle, United Express, and Delta Connection. The two smaller commercial airports in Kentucky are Barkley Regional (serving Paducah), served by Delta Connection, and Owensboro-Daviess County Airport, served by Great Lakes Aviation. The Ashland area is served by Tri-State Airport near Huntington, West Virginia. There are many other smaller, general aviation airports throughout the state. The Audubon Parkway, the shortest road in the system, connects Henderson and Owensboro. The Martha Layne Collins Bluegrass Parkway runs from I-65 on the north side of Elizabethtown to Versailles, just west of Lexington. The Louie B. Nunn Cumberland Parkway runs along the southern tier of the state from I-65 east of Bowling Green to Somerset, near the Lake Cumberland resort region. It has been designated as part of the future I-66. The Hal Rogers Parkway (often called "the Rogers"; formerly the Daniel Boone Parkway), mainly a two-lane road with frequent passing lanes for heavy trucks, connects London with Hazard in the eastern third of the state. The future I-66 will parallel this road, although on a mostly new route. The Bert T. Combs Mountain Parkway connects I-64 in Winchester to eastern Kentucky near Prestonsburg. Note that the eastern half of this road, past Campton, is two lanes. The William H. Natcher Parkway (often called "the Natcher"; formerly the Green River Parkway) connects Owensboro with Bowling Green. The southern half of the highway (Bowling Green to the Western Kentucky Parkway) has also been designated as part of the future I-66. The Edward T. Breathitt Pennyrile Parkway runs from Henderson to Hopkinsville. The section from Henderson to the Western Kentucky Parkway has been designated as part of the future I-69. The Julian M. Carroll Purchase Parkway runs diagonally through the Jackson Purchase (the region west of the Tennessee River), starting at the Tennessee state line in Fulton and ending at I-24 at Calvert City near Kentucky Lake. It will also be part of the future I-69. The Wendell Ford Western Kentucky Parkway (also known as "the WK", from its former signs), is unofficially the longest road in the system, though no longer officially so. Until late October 2011, the WK ran from I-65 on the south side of Elizabethtown to I-24 near Eddyville and Lake Barkley. At that time, the Kentucky Transportation Cabinet, after receiving federal permission to do so, re-signed the portion from Eddyville to the Pennyrile Parkway as I-69. This segment, plus the segment from the Pennyrile to the Natcher, will be part of I-66. KY 80 crosses the southern part of the state, linking Mayfield, Hopkinsville, Bowling Green, Somerset, London, Hazard and Pikeville. KY State Highway 70 crosses the western and central part of the state, linking Frederica, Madisonville, Central City, Drakesboro, Rochester, Morgantown, Brownsville, Cave City, Hiseville, Greensburg, Campbellsville, Liberty, and Broadhead. KY Highway 90 also crosses the southern and southeastern part of the state, linking Cave City, Glasgow, Burkesville, Monticello, Burnside, and the Cumberland Falls State Resort Park area. Kentucky Horse Park: Located in Lexington off I-75. The only park of it's kind and host of the 2010 World Equestrian Games. 1,200 acres of exhibits, pastures, barns, museums and an art gallery. Open year round. General Motors Bowling Green Assembly Plant: Located in Bowling Green off of I-65 exit 28 at Louisville Rd. and Corvette Dr. Bowling Green is the only production site for the classic American sports car, the Chevrolet Corvette and the two-seat Cadillac XLR. Every Corvette produced since 1982 was manufactured at the Bowling Green plant. The plant offers a 1 hour guided walking tours of portions of the assembly area. National Corvette Museum: Located in Bowling Green off of I-65 exit 28 across from the GM Assembly Plant. The museum houses more than 75 Corvettes including one of the original 1953 Corvettes, the only 1983 Corvette in existence, the millionth Corvette produced and many other rare 'Vettes. (Note, however, that eight display cars, including the millionth Corvette, were swallowed by a sinkhole that unexpectedly opened in February 2014; it is expected that these cars will be restored.) Also displayed are photographs, advertisements, television commercials, and Corvette memorabilia. Lost River Cave & Valley: Located in Bowling Green at jct. US 31W and Dishman Ln. The Lost River Cave & Valley offers a 45-minute underground boat and walking tour of a cave discovered by Indians 10,000 years ago. The cave, which is a constant 56 F, was a shelter for Indians, the site of a 19th-century water-powered mill, a campsite used by both sides during the Civil War, a hiding place for the outlaw Jesse James, and a popular 1930s night club. During the summer a butterfly exhibit can be viewed. Crystal Onyx Cave: Located in Cave City, off of I-65 exit 53 then 2 mi. e. on SR 90 to 363 Prewitts Knob Rd. This cave contains rare onyx formations, a lake and cave dwelling wildlife. An Indian burial site dated back to 680 B.C. may also be viewed. Guided 1 hour tours are conducted daily. Mammoth Cave National Park: Located Northeast of Bowling Green, Northwest of Park City, and 10 miles west of Cave City. Mammoth Cave National Park occupies 52,830 acres. Within the park is Mammoth Cave, which is the worlds longest known cave system. It contains 365 miles of underground passages charted on five levels. Guided tours that range from 1.25 to 6 hours and vary in degree of difficulty are conducted daily. Swope's Cars of Yesteryear Museum: Located in Elizabethtown at 1100 N. Dixie Ave. Among the restored vintage automobiles displayed in the museum are such luxury cars from the 1920s and '30s as Packards, Pierce Arrows, Hupmobiles and a 1939 Rolls Royce. Cars on display from later decades include several '60s Chevrolet Impalas, a 1956 Ford Thunderbird, and a 1961 Metropolitan. Also this museum is free. Patton Museum of Cavalry and Armor: Located on Fort Knox army base the museum is named for WWII General George Patton. Displays include German and Japanese war artifacts, an extensive collection of US and foreign tanks and weapons, and mementos of Patton's military career, including his wartime caravan truck and the sedan in which he was fatally injured in 1945. US Bullion Depository: The 100-square-foot, 1937 treasure house is bombproof; its walls and roof are faced with huge granite blocks. At different times the vault has also held one of the copies of the Magna Carta, the US Constitution and the Declaration of Independence. The depository is closed to the public but can be viewed when driving on US 31W. 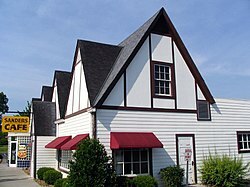 Maker's Mark Distillery: Located in Loretto off of SR 52. The distillery began operations in 1805. The former master distiller's home, built in the 1840s, is now the visitor center and the starting point for the 50 minute guided tour. Highlights of the tour include the still house, the fermenting room, warehouses, and the bottling house. Jim Beam's American Outpost: Located in Clermont about 2 miles east of I-65 on SR 245. A film about the burbon making process is shown in the tourist center, a replica of an old tobacco barn. The historic Beam family home and rackhouses where the bourbon is aged in oak barrels also can be seen. Churchill Downs: Located in Louisville on 700 Central Ave., is the historic racetrack where the Kentucky Derby is run. Racing seasons aer late April through early July and late October to November. A 30 minute guided tour is available through the Kentucky Derby Museum. Kentucky Derby Museum: Located adjacent to Gate 1 of Churchill Downs. The museum showcases the Thoroughbred industry and the Kentucky Derby. Two floors of racing artifacts, interactive exhibits, and fine art relate the tradition of Derby Day. Louisville Slugger Museum: Located in downtown Louisville on the corner of 8th and Main Sts. The entrance to the museum is distinguished by the 120 foot, 68,000 pound steel baseball bat. Visitors can view collections of baseball memorabilia before moving on to the guided tour of the manufacturing facility where you can see the bats being made. Wherever you travel in Kentucky, you are never far from one of 52 Kentucky State Parks. Each park has its own unique attributes, from shorelines to majestic mountains, from winding caves to enchanting woodlands. My Old Kentucky Home State Park: Completed in 1818, the home was owned by famous Kentucky politician John Rowan and his family. Tours are conducted by guides daily. Located in Bardstown on US 150. Kentucky offers seventeen state resort parks, more than any other state. This wealth of resort parks, each featuring a full-service lodge and dining room, has given rise to our reputation as "the nation's finest state park system." The Kentucky State Parks operate 24 recreation parks that offer a variety of activities for visitors, whether you have a few hours, a day or a week to spend with us. You can visit these parks and enjoy camping, fishing, golf, boating, hiking, picnicking, tennis, mini-golf, horseback riding, historic sites and much, much more. Kentucky offers eleven state historic sites, where the unique and colorful history and heritage of our Commonwealth comes alive. You can also visit our many State "Recreation" Parks, many of which have their own history to tell. Kentucky State Parks offer a great variety of species and settings for fishing. Anglers have a choice of largemouth and smallmouth bass, striped bass, trout, bluegill, crappie, catfish and many more kinds of fish at state parks. And for beginners, many parks have fishing equipment to loan to guests. Kentucky is famed for bluegrass, bourbon, beautiful mountains and thoroughbreds. And, spurred by a renewed focus from the State Park system, golf now is becoming a larger part of Kentucky's recreational reputation. With 19 State Park golf courses, there is sure to be something for everyone. There’s plenty of water to go around for a swim at Kentucky State Parks. The parks operate more than two dozen swimming pools and 11 beaches at lakes. And during the winter, there are indoor pools at Lake Cumberland and Lake Barkley resort parks. More than $2.5 million has been spent in recent years on improvements at campgrounds, which offer 2,600 improved sites. Reservations are now available for the campgrounds. You can enjoy campground activities such as entertainment, arts and crafts, mini golf, cook outs and nature programs. The state parks oversee 15 marinas that offer pontoon and fishing boat rentals. The marinas also provide a variety of services including fuel, fishing licenses, ice and slip rentals. And many parks have canoes and paddle boats as well. Rockin Thunder Jet Boat Rides: Enjoy the only Jet Boat tours of the Kentucky River. 5 different tours to choose from including a 90 mile Sunday Dinner Adventure to an 1850's plantation. Most popular is the 155 mile 2 day Kentucky River Adventure round trip from Madison Indiana to Frankfort Kentucky. Pass through 4 locks built in 1838, spot Bald Eagles and cruise through the remote river of Daniel Boone and the Shawnee Indians. Open late May into October. Nothing else like it in Kentucky. Kentucky State Parks offer nearly 300 miles of trails suitable for all levels of enjoyment. From the remote 45 miles currently developed on the Pine Mountain Trail State Park to the .5 mile self-guided interpretive trail through the Civil War redoubts at Columbus-Belmont State Park, there is an outdoor experience that will satisfy everyone! Looking to explore some new surroundings with your favorite equine companion? Visit one of the scenic Kentucky State Parks horse trails and escape for the day. Or, spend the weekend at a “horse campground” for some cowboy time under the stars. You will find several parks are equipped with seasonal riding stables for the whole family to enjoy. Horse back riding is also an option at many private stables, and at the Kentucky Horse Park seasonally. During hunting season, wear brightly-colored clothing if you go into the woods. If you are backpacking, biking or any off-road adventure, register with the Park Office. Make sure you call or visit on the way out. It only makes sense, you may get lost, or break something. Cell phones may not work in these areas. Kentucky's cuisine is similar to traditional southern cooking, although in some areas of the state it can blend Southern and Midwestern. Kentucky has invented several dishes; most notably the Kentucky Hot Brown and beer cheese. The Hot Brown was developed at the Brown Hotel in Louisville. The dish is usually layered in this order: toasted bread, turkey, bacon, tomatoes and topped with mornay sauce. Beer cheese is a cheese spread that originated in Central Kentucky near Winchester. While there are conflicting stories on where beer cheese originated, Johnny Allman's, a restaurant on the Kentucky River (present-day site of Hall's on the River) is generally credited with inventing the dip. Colonel Harland Sanders began Kentucky Fried Chicken in Corbin. Today, visitors can see where the restaurant got its start. Ale-8-One, known colloquially as Ale-8, is a regional ginger-flavored soft drink, distributed only in Kentucky and portions of neighboring Indiana and Ohio. Bourbon, America's native spirit, is produced almost exclusively in the state of Kentucky. Many major distilleries are clustered in Central Kentucky in picturesque settings near a natural source of water. Wet – This means that an area allows full retail sales of alcoholic beverages, either packaged for off-premises consumption or by the drink (as in bars or restaurants). All cities in the state with a population of 20,000 or more now allow off-premises sales. Dry – An area that does not allow sales of alcoholic beverages at all. Note that some otherwise dry areas do allow for sales at wineries (about 25 around the state), golf courses (also about 25) and certain historic sites (currently one). Moist – This is the most confusing designation, with two different meanings. The state officially uses "moist" strictly to describe otherwise dry counties in which at least one city has approved full retail sales. Examples of "moist" counties in this sense include Warren County, in which Bowling Green is wet, and Hardin County, where three cities, including Elizabethtown, are wet. In popular usage, "moist" more often refers to a location that does not allow package sales but has allowed sales by the drink in larger restaurants. Depending on state and/or local law, establishments with licenses to sell by the drink may or may not have dedicated bars—but all must derive at least 70% of their revenues from food and non-alcoholic drinks. Before it voted wet in 2012, Georgetown was the state's largest "moist" city in this sense. Oldham County, a major suburban community for Louisville, is "moist" in both senses. Its county seat of La Grange has very recently voted itself wet; outside that city, package sales are prohibited but restaurant sales by the drink are allowed. 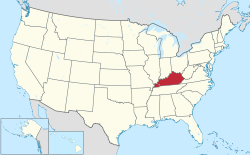 Kentucky is bordered by seven other states. Missouri - To the west of Kentucky, Missouri can boast of having St Louis, home of the Gateway Arch and Union Station. Illinois - Located to the northwest of Kentucky, Illinois is also the home of Abraham Lincoln in Springfield. Indiana - Kentucky's northern neighbor, Indiana has several caves to visit and is rich in covered bridges. Ohio - Another northern neighbor, an easy day-trip from Kentucky is the city of Cincinnati, home of Kings Island and the Bengals (NFL) and Reds (MLB). West Virginia - Located east of Kentucky, West Virginia has the New River Gorge Bridge, one of the highest in the eastern US. Virginia - To the east of Kentucky (and south of West Virginia), Virginia has the Blue Ridge Mountains and Shenandoah National Park. Tennessee - Tennessee shares Kentucky's southern border. Here you'll find the Great Smoky Mountains National Park, the music city of Nashville and Elvis' home in Memphis. This page was last edited on 7 March 2017, at 00:40.